My readers will know that i have been warning about a crash in both the stock markets and the economy since early this year. From my previous post in march 08 i warned of a crash. I am here this evening to tell you the worst is not over, it can begin as early as tomorrow, Thursday Nov 20th 2008. Today we closed below 8,000 on the Dow for the first time in three years. This is the message the mainstream media is pumping out to the block heads. What the MSM is leaving out is the October crash low of 7,773.71. We closed today at 7,997.28, roughly 200 points from the crash low. Everyone with half a block head knows is a crucial level. As i write this the Nikkie is down -304.74 or -3.68%. Odds are this sell of will continue into the morning. With so many horrible situations (fundamental, financial ticking time bombs detailed in my previous crash post) i must ask, is this it? Is this the simultaneous economic/market/currency crash i have been warning of? Is this the beginning of our new U.S. currency or even worse a new global currency? Many of you think the worst is over, the bottom is in. I have news for you block head, you have not felt enough pain. Your not in enough pain to give up your financial sovereignty. This is why the worst is yet to come. 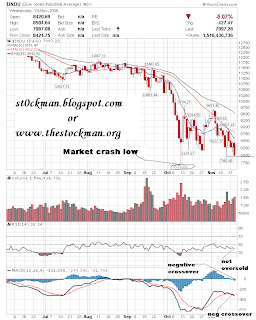 When we hit our october crash low the market was clearly oversold as indicated on my chart below. When we hit this low again we will not be oversold as seen in the relative strength section of the chart. You will also see the macd crossover and other technicals are leading to a new, solid down trend.